Good afternoon. It is a great day in boxing. As the fight of the year, which every boxing fan throughout the world has wanted to hear about and see, has finally become a reality: Cotto versus Canelo Alvarez, a 12 round fight for the total WBC and Ring Magazine Middleweight World Championship will take place on Saturday, November 21 at the Mandalay Bay Events Center in Las Vegas. The event will be produced and distributed live by our friends at HBO, Pay Per View, beginning at 9:00 PM Eastern, 6:00 PM Pacific time. The fight is presented by ROC Nation sports, Golden Boy Promotions, Miguel Cotto Promotions and Canelo Promotions. The event will be sponsored by Corona Extra, México, Live It to Believe It! and O’Reilly Auto Parts. All information regarding ticket availability and our upcoming press tour for this fight will be announced very shortly. I’d like to acknowledge obviously some very important people on the line today, starting with Miguel Cotto, Gaby Penagaricano, Brian Perez, Hector Cotto, Oscar De La Hoya, Eric Gomez, Canelo Alvarez, Chepo Reynoso, Eddy Reynoso, Ken Herschman, Mark Taffet, and Richard Stern of MGM and Sid Greenfeid (ph) of MGM, as well as ROC Nation boxing chief operating officer, David Itskowitch, as well as Dino Duva. Without a doubt, this is the biggest fight that can be made in the sport. And without a doubt, this is the one fight that again fans throughout the world have been anticipating for months and months and months. This fight is the fan’s fight. It will have guaranteed action and is Puerto Rico versus México. It’s a proud moment for ROC Nation sports and our boxing division. Almost one year ago to the day, after the formation of our boxing division, we are announcing the biggest fight in the sport. Now, to say a few words about the event and to introduce Eddy Reynoso and Canelo Alvarez, I’d like to turn it over to my good friend, to the man that was so professional and exhibited so much class during our negotiations, the Chairman and CEO of Golden Boy Promotions, Mr. Oscar De La Hoya. Thank you, Michael. I’m pleased to be on this call this afternoon to talk about the exciting upcoming fight between two champions. This fight, both Cotto and Canelo want it, and the fans have been asking for. We are pleased to be working with Roc Nation to make this fight a reality for the fans. It will have everything that the fans want to see in boxing, and that’s action and intensity. Thank you, once again, to Michael, to David, all the folks at ROC Nation. It really was a pleasure to be working with you on making this fight happen. Obviously everyone at the HBO family, this is Canelo’s second fight on the network since signing the exclusive agreement with HBO last September, and as you know, HBO wants to show the best fights and fights that pit the best against the best. So I’m pleased Cotto v. Canelo will be televised live on HBO Pay Per View. Also I want to thank our sponsors for their tremendous, tremendous support: Corona Extra, México, Live It to Believe It! and O’Reilly Auto Parts. We are pleased to always announce that the activations and the marketing that will be done for this event will be like no other. And today, I am extremely proud to be introducing team Canelo. Canelo keeps on impressing us with every single fight. He has an impressive record of 45 1 with 32 knockouts. He just turned 25 years old. He hails out of Guadalajara Jalisco, México, and he has conquered the boxing world. He has captivated fans around the world with his action packed fighting style, with his charisma, and most importantly, his willingness to take on the toughest challenges. So for this fight against Miguel Cotto, Canelo has already started training camp. He is training hard and he will be ready for this war; and a war it will be on November 21. Mark my words, Cotto versus Canelo will be without a doubt the fight of the year. Boxing is alive and well in 2015. Let’s talk a little bit about the rivalry. I mean, it doesn’t get any better than this. Puerto Rico versus México, boxing’s best rivalry, without a doubt, this fight will be the most exciting, the most action packed and the most intense in recent years. You go back to the Julio César Chávez days and you go back to Salvador Sánchez and you go back to Benítez, Gomez, the list goes on and on and on. And now Miguel Cotto and Canelo Alvarez will write their own history, one that people will remember for a very long time as being one of the best fights in the history of the sport. Both fighters are willing, are hungry, are ready, and we cannot wait for this action packed fight that’s guaranteed because of the style. So let me introduce to you Team Canelo. First up, Eddy Reynoso. Good afternoon, thank you to everybody that’s on the conference call. We are just very excited, very happy that the fight was made, and rest assured, this is going to be one of the biggest fights in this great rivalry between México and Puerto Rico. DE LA HOYA: At this moment, I would like to present to you, my good friend from Team Canelo and that is Chepo Reynoso. Good afternoon to everybody. Like my son said, I’m very excited, I’m very happy the fight has been made, and very confident that this is just going to add to that chapter of great rivalries between México and Puerto Rico. We have the ingredients in these two fighters of warriors, warriors, tremendous fighters, that will be in the center of the ring and fight their hearts out. Neither of them will take a step back, and that’s what’s going to give the fans one of the best fights, one of the fights the fans have been waiting for, and you, the media, as well. Thank you once again, and we are excited to be working and working hard to get this victory. DE LA HOYA: Gracias, Eddy, Chepo. Now it is my pleasure before I introduce the champ, I want to say one thing. In regards to the Pay Per View, we are discussing the fight which we will announce later on shortly. But mark my words, it will be a lot less than a hundred dollars, that’s for sure. So people are going to get a bang for their buck, and people are going to get guaranteed action, so we are just thrilled and happy that the fans are going to be the winners in this fight. It is now my pleasure to introduce to you, the former WBC and WBA Super Welterweight World Champion, he’s the Mexican superstar, Saul Alvarez. Good afternoon to everybody. I just want to say thank you. I’m very excited. I’m very happy. I’m honored to be fighting a fighter like Miguel Ángel Cotto who has achieved everything, and I assure everybody, I’m going to train hard like I always do, prepare. I want to thank everybody who made this fight possible, and I’m excited. I’m going to train very hard as always. Q. Canelo, I’m wondering if you can answer: The fight has sort of been in the process of being made for a while. I know there’s a lot of people that look at this, like it dragged out for quite some time. Was there a point during all this, where you felt like this wasn’t going to get done for whatever reason, and how were you dealing with the emotions of getting to the point where the fight would finally be finalized? I know it’s a big one for you. CANELO: It was a little long, the process, like you said. But that’s usual or common when there’s fights of this level, of this magnitude. I never lost faith that it was going to happen, whether it was here or the next fight. I was sure that this was the fight obviously that everybody wanted to see and that it was going to happen. I’m just very happy it happened now and we are going to get ready for it. Q. When you look at the kind of resumé that Miguel has put together in his career, he’s won a lot of world titles, and he’s been involved in some of the biggest fights in boxing for the better part of 15 years or so. What is Canelo’s thought of Miguel as a fighter, and just as a fan of boxing; did you like watching him fight when you were younger? CANELO: Oh, definitely. He’s had an illustrious career. I’ve always liked watching him fight; his style, his boxing. It’s a great honor for me to be fighting a fighter like Miguel Ángel Cotto, and I’m thankful to God that this fight is happening and I’m just very excited. Q. Everybody has been talking about this is another one of those fights in that great México versus Puerto Rico rivalry. From your point of view, even though you’ve had a lot of big fights already in your young career, did you think about the fact that at some point you wanted to have that kind of big fight, but one that was going to be remembered or that was highly anticipated in the pantheon of those great matchups between the Puerto Rican fighters and the Mexican fighters, and it seems that this is the one for you; that this is the kind of fight that fans of that rivalry will remember for a long time. CANELO: Yes, definitely. This is a fight that I’ve been craving, I’ve been wanting. Obviously it’s a fight with a lot of responsibility, and I’m up for it. Like I do for all my fights, I train very hard and I prepare myself. But yes, I’m looking forward to it because I know it can go down in history as one of the great fights between México and Puerto Rico and that’s what I’m looking forward to. My career is still far from over. I have many more fights to come, but this is one of the one that is I’ve been craving and wanting so bad. Q. Did it bother you with the negotiations, the color of the ring, who comes in first, who comes in second? CANELO: No, not at all. You know what, I’m very happy that the fight has just been done. I’m going to prepare. It’s an honor for me to be fighting someone like Miguel Angel Cotto, and we are going to prepare to win. We are going to train very hard like always and go out there and get the win. Q. Will this fight with the win put you at the pinnacle of your career, put you at the top and put you in another dimension in boxing? CANELO: Yes, exactly, these are the type of fights that I’ve always wanted, the big fights. It’s an honor to be fighting someone like Miguel Angel Cotto because of the illustrious career he’s had and we are going to train very hard. We are very motivated, very inspired to go out there and get the win, and keep advancing in my career. Q. The people will not leave upset like they did with the Mayweather Pacquiao fight. CANELO: No, not at all. This is a guarantee. Without a doubt, this is a fight. We are both coming to win. We are both going to fight. We are both going to lay it on, and without a doubt, this is a fight for reals. Q. Was it a victory to have the fight in Vegas over New York? CANELO: No, not at all. New York, Vegas, wherever, it’s the same thing. I think Vegas is just a neutral for both of us. Q. Are we looking at it like a mirage, or just a rejuvenated Miguel Cotto who is having his best moment with Freddie Roach? EDDY REYNOSO: No, he’s a tremendous fighter with tremendous experience. We know what he’s brings and he’s a great fighter and we respect that, and we are going to prepare very hard for it. And right now, just adding Freddie Roach, he’s looked tremendous. Q. Do you have added pressure? Do you feel like you have to lift the fans’ expectations because of the fiasco recently between Mayweather and Pacquiao? CANELO: No, I don’t base myself on other fights or other fighters. I focus on my fight and what I have to do, and that’s what I’m prepared to do. I’m going to train for that. Q. The expectation of this being another chapter to the México/Puerto Rico rivalry? CANELO: Yes, of course, it’s already started. You can sense it and that’s what we are going to prepare. Like I said it before, the styles will mix in well. We are going to clash well and it’s going to be added to the record books. It’s going to make history. We are going to put on a great fight. Q. When did you first think about fighting Cotto and when do you think you were ready to challenge Miguel Cotto? CANELO: It’s been about three years that we’ve been my group, my team, we’ve been thinking about this fight. And obviously from three years on, as it moved closer with every fight, the fans started clamoring it and talking about it. So it’s been on my mind for about three years. Q. You really felt that you were ready to face and potentially beat Cotto; when did you know that you were ready for Cotto? CANELO: Three years ago. Three years ago when it first came in mind, because I knew I could win. That’s why it came to my mind. It didn’t happen for whatever reasons back then. But now the fight’s here and we’re very happy and anxious and grateful and thank God. Q. Who needs who more: Do you need him more or do you need him more? CANELO: It’s mutual. I think the fans wanted it. We wanted to give it to the fans. We want to give them a great fight so it can go down in history and it’s a mutual. We got together and decided, let’s give it to the fans. Q. How much easier were negotiations this time than the first time, I guess whatever went on that the fight didn’t happen? How much easier was it to secure the deal this time? DE LA HOYA: For some reason it didn’t happen the first time around. But both times were fairly easy. When you have a partner like ROC Nation who understand the importance of this mega event, it takes time. It takes patience. It takes a lot of hard work. But I would have to say it was fairly easy working with ROC Nation in putting this fight together. It was a long process, and like I said, it didn’t happen for a reason the first time around. But we’re extremely happy and proud that it is taking place November 21. Q. I know obviously you wanted the fight to happen in May to celebrate Cinco de Mayo, but do you think it’s a blessing in disguise, the performances they both gave in May and June, makes the fight that much bigger. DE LA HOYA: The fight is huge now. Obviously we recognize that in May, Mayweather Pacquiao was taking place, and now that that fiasco is all over with, we can focus on promoting the biggest fight in the history of the sport in November. So we have no obstacles in front of us. We have our engines revved up ready to go and we’re going to promote this event to the world, and it’s going to be one of those events that the world is going to talk about for many years to come. Q. Do you feel like this is going to be your introduction to a full time career at middleweight, or is the weight more so to weigh your options as to whether or not you could retire as a Super Welterweight? CANELO: Right now the importance is this fight. I can’t tell you what’s going to happen in the future. Anything can happen after this fight but right now my focus is just totally on this fight. I feel very comfortable in my current division, Super Welterweight, but who knows, who knows what happens after. Only God knows. Q. This fight is going to be fought at a test weight of 155 pounds, but still for the total middleweight title. The fighting at 155, is that going to be a tough sell, or does it not matter because the match-up is such a good match-up? DE LA HOYA: Well, this is a fight that’s going to be for the middleweight title that Miguel Cotto holds. I mean, both Canelo and Cotto are obviously going to sell this fight alone. Whether it’s for no title or for a title, this fight is going to be a guaranteed sell with the fans because the fans know that this is going to be an exciting fight. Q. Michael, there was talk about Andre Ward possibly fighting is that a done deal or is that still be worked out? YORKMAN: It’s something that we are discussing but we are not we have not focused quite frankly on the undercard. That’s something that now after today’s announcement, Oscar and his team, David and his team will discuss further. But it is a consideration. Q. Obviously in the Hispanic community, there’s always the rivalry, the fights. What one or two fights do you recall, because we know you like watching boxing and the history of boxing. Do you recall between México and Puerto Rico, which stand out or which couple fights stand out? CANELO: Salvador Sánchez against Gomez; Julio César Chávez against Macho Camacho; and Oscar De La Hoya against Trinidad. Right now I’m just very excited and motivated that I’ll be going into the history to add to that rivalry. That brings all the excitement. Q. Are you ready to take that torch? Obviously in the Pay Per View, we’ve seen what you’ve done in your last few fights with the attendance, the fans, the numbers. Are you ready to carry on that torch as the leader in the Pay Per View with the fans and the fan favorites? CANELO: All I do is train hard. I work hard. I fight to win. Obviously I win, and the rest is extra. The rest is a bonus. It just comes with the territory; it comes with the wins. But I’m not worried about that. It will come in I’m sure. Q. Obviously there’s talks that he is past high and not young anymore, but we see that he’s having his best moment. Eddy, how do you prepare Saul? How do you prepare for a fight against a fighter like Miguel Angel Cotto? EDDY REYNOSO: We prepare like we always do. We have plenty of time. We have three months to get ready. We train hard. We know when we’re having fun. We have to see all his virtues and his strengths. But we also have a great fighter that knows that to do up in the ring and has a lot of talent. We have plenty of time to get ready and that’s what we’re going to do. We’re going to train hard. Q. Best of luck in the fight. In your career, the times you’ve had trouble in fights against guys who are slick boxers, Trout, Mayweather, guys who stick on the outside and box and Cotto is not that kind of a guy generally speaking. Do you think that plays into your strengths; that if this fight becomes a war, that your physical advantages and your youth will help you pull out the win? CANELO: No, this is a 50/50 fight. I’ve said it, with his experience and everything, it’s 50/50. The winner of this fight is the one that’s going to train better, that’s going to work harder and that’s going to be able to lay out that plan inside the ring, and that’s what I’m going to work for. I’m going to prepare myself to win. DE LA HOYA: Thank you very much to everyone, and like Michael said, we will be announcing everything else shortly. The undercard will be announced, the great, exciting cards that we will be putting together. Thank you to all the media across the globe. We cannot wait. Both fighters will be in tremendous shape and this fight will be guaranteed fireworks come November 21. CANELO: I just want to thank everybody and let’s all enjoy this moment, everybody that made this happen. I’m just very grateful and looking forward to it. Thank you so much to everybody for making it happen. YORKMAN: Let me go back for a moment. I’d like to thank, once again, Oscar De La Hoya, our partner at Golden Boy for his support in making this fight. I’d like to thank HBO Pay Per View, as well as the Mandalay Bay. We look forward to working with both organizations over the next couple of months. As Oscar said previously, this is the fight of the year, without a doubt. It’s going to be action packed. Boxing fans throughout the world will be treated with an incredible value and a fight that will be filled with nonstop entertainment. I once again want to acknowledge Team Cotto: Miguel Cotto, Gaby Penagaricano, Brian Perez and Hector Cotto. I’d like to introduce the face of ROC Nation boxing, the reigning WBC and Ring Magazine Middleweight World Champion, the first native of Puerto Rico to become World Champion in four different weight classes, the future Hall of Famer who has had 23 World Championship fights, and one of the biggest gate attractions in boxing, and one of the largest Pay Per View draws among active fighters around the world: I am proud to introduce the champion, Miguel Cotto. Hi, everybody. Welcome to our press call, and I’m happy to be here and looking forward to the fight on November 21. Q. This is such a big fight, but you’ve had a lot of these big fights before in your career, most of your career, had one big one after another. Is there any way that you can sum up in your mind where this rates in your anticipation or what you believe the fans’s anticipation is for this fight compared to all of the other big ones that you’ve had? COTTO: Mine, I just can say that this fight is just another fight. I’m going to go to L.A. when we decide to go there, do my best as always, and go for Vegas to beat Canelo the night of the 21st. Q. So you don’t think this is even your own personal excitement level or determination level on this is not a little bit bigger than other fights just based on the magnitude of interest from the public, from the media, the things that Canelo has accomplished, his fan base; you don’t think it’s bigger than another fight? COTTO: I’d say Mayweather plays Martinez, he plays Pacquiao, he plays everybody. In my era, Canelo is just another name. Bring another big name to my record, and that’s what I see Canelo for my fight. Q. So let me ask you this, then. He was very complimentary I to you. He said he called your career illustrious and he had all the respect for all of the things that you accomplished. Curious on your opinion on what you have seen from Canelo. He has not seen the accomplishments and has not fought nearly as long as you. How do you look at him? Are you a fan of his? Do you like watching? Have you met him? What are your thoughts about the young man? COTTO: I’m not a real big fan of boxing. I’m just enjoy boxing when I’m boxing. But I know Canelo is a great fighter. I know he is a strong boxer. But I’m going to prepare enough to beat him the night of the 21st. Q. A lot has been made already about the magnitude of the fight because of the fact that it putts yourself on one of the top Puerto Rican fighters in boxing history against Canelo Alvarez, probably one of the most popular Mexican fighters in boxing today and we know that’s a tremendous rivalry. You’ve had some of those fights, particularly against Antonio Margarito. What’s your view of that rivalry? Do you take it very seriously? COTTO: Every fight is different. Canelo is a different boxer than than that if it was the day of the fight. But I know it’s going to be a great fight, a huge fight for all the fans, and I’m going to do my best to make a real nice fight for all the fans. Q. Does the rivalry mean anything to you between the countries and their fans? COTTO: Everybody knows what a fight between a Mexican and Puerto Rican means for boxing. People can expect the same from us. Q. I asked Canelo the same question. Do you see 155 as your natural weight for however long? With the fight taking place at 155, do you see that as close to your natural weight for the rest of your career, your fight weight? COTTO: With Geale was weight of 157 pounds, and Mayweather (ph) 153. The one with Martinez was for 159; I was 155. I’m a real middleweight. I look myself more than a Super Welterweight. Q. Freddie, you’ve won three times with Cotto and he has looked better each time that you have had him. But Canelo is ten years younger and is physically stronger. How do you prepare a game plan for that? We have a big game plan for Miguel and we are going to work on that together. He’ll be in great shape of course. I don’t think he’s stronger than us to be honest with you, and I don’t think that’s a factor in the fight. I think we’re stronger than him. I think we’re the better puncher, and we will show on fight night. But we will come up with a big game plan like we did in the last three fights. Miguel is a really hard worker and he’s very dedicated. Me and him, we do work very well together and I expect this to be one of the greatest fights of all time. Q. Do you have the strength in your hands to put down a fighter that never has been down? COTTO: I only have to be smart not strong enough to put him down. I have to be smart enough to do the job. Q. This fight can be the very fight of the year, and could be a record selling on Pay Per View. Q. Just wondering, looking at Canelo’s style, he’s such a fighter that during his career, he’s struggled against guys, Trout, Mayweather, guys who could box him and who could neutralize his advantages, his physical advantages in the ring. Do you see any weaknesses in his game, anything that you think that you can exploit in there or anything that you can do similar to what those guys have obviously done? Obviously your preferred style, Miguel, but anything you can take from the fights that he struggled that you can use against him on the 21st? COTTO: When you have more than one tool in your bag, the opponent can bring whatever style he wants to bring, and you have something in your bag for it. We’ll do the same for this fight. Q. Do you see anything stylistically in Canelo that works to Miguel’s advantage? ROACH: He’s a good fighter. He’s a young guy. He’s a good puncher. He’s been in there with everybody. I think his last fight, it wasn’t a very high calibre opponent; and then someone told me, ours wasn’t either. And I said, no, ours was; our was a former two time world champion. So I think better fighters I think this is a big step up for him and I think that we’re going to, Miguel will take him to school. I think we’re just too smart. We’re going to come out with a really good, great game plan. Me and Miguel worked really hard on that, we work really hard together and we are going to be at our best for this one. Again, this is a big, big fight for us. Q. Do you think he’s going to come in there a little bit reckless like he did against Kirkland, being more of a puncher and not being much of a technician? COTTO: I don’t think too aggressive or too reckless. He knows Miguel is a smart fighter and good counter puncher. But the thing is we’ll be coming like (inaudible) did it to him. We’ll see. But the thing is, as we work the game plan out and as we go with the sparring partners, I have some really good ones for this fight in my gym, and it’s going to be exciting, I’m sure. Q. Two part question for you. I wanted to know, how badly you wanted the fight to take place in New York, since that’s where most of your biggest ones have been held, and do you feel like you’re actually due for a huge win in Las Vegas? COTTO: I don’t care what is the place or the fight, no matter where, I’m going to do my best with Freddie. I’m going to do my best in the fight. And regarding the first part of the question, what was it? Q. How badly did you want the fight to take place in most of your big wins take place in New York. 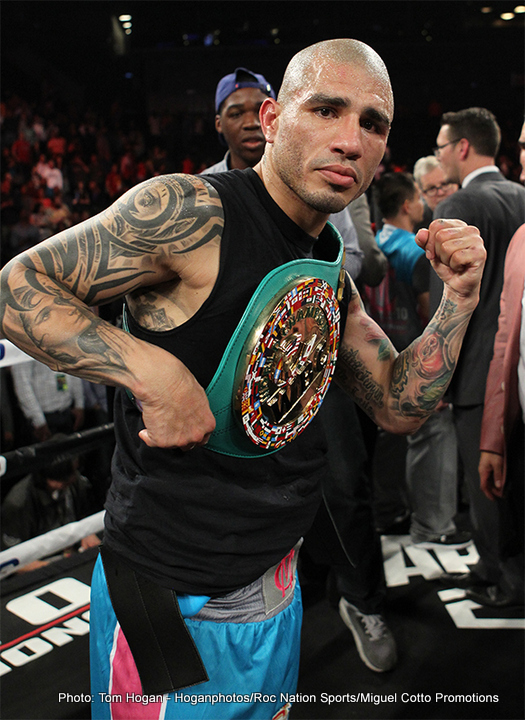 COTTO: That was a real big negotiation for this fight, but it’s already happened. It’s already made for us, for everybody, for the fans all over the world. I’m just going to be ready for him. YORKMAN: Now that all the questions have been asked, I’ll just make a couple of closing comments. I do want to say that again recording ticket availability and the press tour, as well as the undercard, that information will be available hopefully within the next week to ten days. We are planning a press tour, and we should have those dates actually confirmed by the beginning of next week. I want to thank Miguel for joining us today. I want to thank Freddie for your time. Again, this is a very exciting moment for ROC Nation. You know, this is our one year anniversary almost to the day and to have the opportunity to promote this type of fight on this type of stage is truly an honor. We look forward to promoting along with Golden Boy the absolute fight of the year, no question about it, a fight that obviously fans around the world have been anticipating, a fight that will be action packed and will absolutely live up to expectations in every which way. We look forward to seeing you all on November 21. Thank you for your time today, and have a great afternoon. Next boxing news: “Bekman” Soylybaev returns to battle August 27 in Los Angeles! !